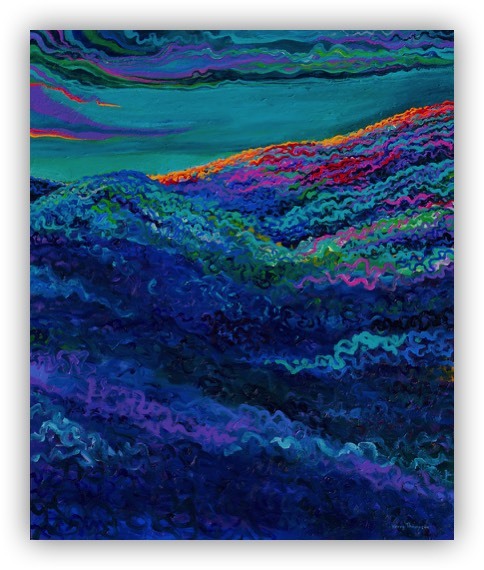 This painting was built, unusually for me, on a canvas painted dark purple/blue. I usually paint onto white and love how light bouncing back off the canvas through the paint keeps it bright. One time I smushed a painting together that wasn't working, leaving a dark muddy green, then painted on top and was surprised by the rich effect. That painting was "Gully gum" (click on the title to visit it). Using battered thick paintbrushes and creating randomly wiggly lines layering colour upon colour, the shapes of the hills and the woodlands emerged. Finer battered brushed towards the top of the ridge created smaller trees in the distance. The sky is a reflection of the colours and squiggles below - with some direct light from the sun and some light reflecting off the ridge.